Sweetheart neckline meets vavavoom curves with this 50s Deadly Dames Poison Ivy Pencil Dress! This knockout beauty features pleats at the bust, flattering pleats at the hips and elegant, broad, pleated shoulder straps. Made from a stretchy, slightly shiny, black rayon blend which hugs your curves perfectly and the built-in stretch bengaline shaper gives support, structure and holds you in; hourglass figure assured, just like Micheline Pitt. 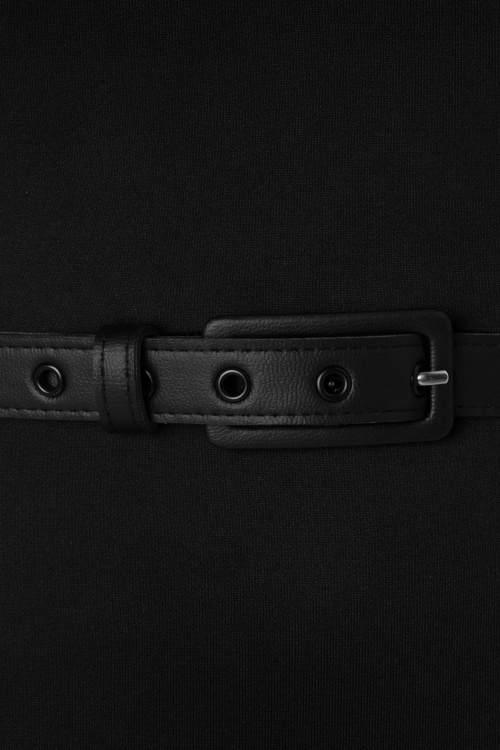 The black faux leather belt emphasizes your silhouette even more... Ivy loves your curves and is not afraid to show it! Dutch weather woman Amara Onwuka wore our dress!